The Jefferson Mall in Louisville, Ky., is planning to ban a woman who was caught on video hurling racist remarks at two Hispanic customers, the Lexington Herald-Leader reports. 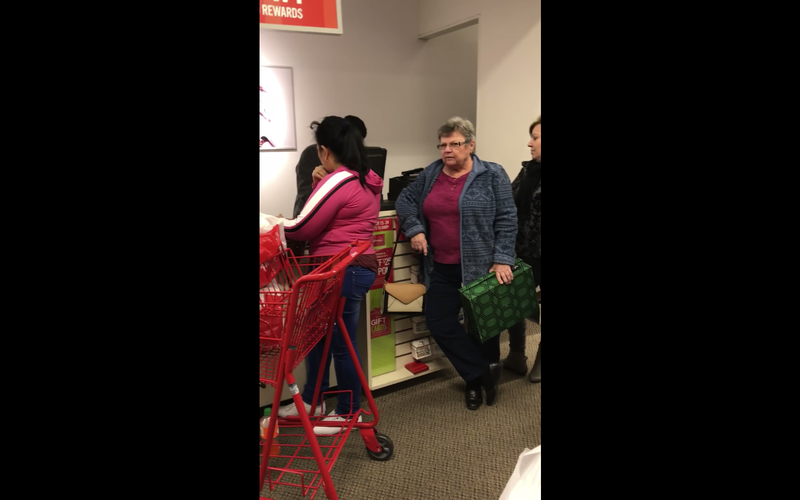 The video, which was originally posted on Facebook by Renee Buckner on Tuesday night, showed the unidentified white woman verbally blasting the Hispanic women in line at a J.C. Penney. Buckner explained that one Hispanic woman had walked up to the front of the line to add items to her friend's purchase, which was being scanned by a cashier. The elderly white woman apparently believed that the woman had cut the line, and launched into the profanity-laced tirade. “It starts back there,” the woman insisted, pointing to the end of the line. “And it don’t bother me if I say it, and I don’t care if everybody hears me. I think everybody here probably feels the same damn way I do. "Just go back to wherever the [f—k] you come from, lady," she added. When the cashier attempted to tell the older woman to be mindful of her language, she continued, insisting, "Hey, tell them to go back where they belong. You know, they come here to live, then act like everybody else. Get in the back of the line like everybody else does." The woman then turned back to the pair who were trying to shop, calling them "nobodies." Editor’s note: Video contains language that some may find offensive. One of the women who was being attacked attempted to calm the older woman, saying, "I said sorry." The older woman responded by telling them to speak English. "Speak English. You're in America," the enraged woman countered. "If you don't know it, learn it." Later Tuesday night, Jefferson Mall officials responded on Facebook, saying that they were working with J.C. Penney to identify the woman and ensure that she was banned from the mall. "Jefferson Mall strives to create a comfortable and convenient experience for all of our guests and we absolutely do not condone this type of behavior. We will work to identify this woman, and once identified, she will be permanently banned from Jefferson Mall, per our Behavioral Code of Conduct," the mall said in its Facebook statement.